Alice Nkom broke barriers for women by becoming the first female barrister in her country of Cameroon. She is also well known among Lesbian Gay Bisexual Transgender and Queer (LGBTQ) activists worldwide because of her legal advocacy for gay rights. Nkom was born in 1945 in Poutkak, Cameroon in West Africa to Martin Nkom Bayi and Alice Ngo Bikang. She was one of eleven children. Nkom pursued higher education in France at the University of Toulouse (1963-1964) and completed her studies at the Federal University of Cameroon (1968). In 1969 at the age of 24 she became Cameroon’s first female attorney. Throughout her law career Nkom has defended low income and vulnerable people, including political prisoners, street children and women. Since 1976, she has been a stakeholder in one of the most prestigious law firms in Cameroon. After seven years of marriage, Nkom went through a divorce in 1979. She has two children, Charles and Stephane, and eight grandchildren. The year 2003 was pivotal for Nkom. As a delegate from Cameroon, she visited Portland, Oregon as a participant in the World Affairs Council’s International Visitor Program sponsored by the U.S State Department. She returned to Portland in 2011 as a distinguished alumnus of that program. Her experiences in Oregon opened her eyes to the power of participatory democracy, community organizing and youth involvement in politics. Back home she engaged young people and women in voter registration. This work continues. In 2003 in an effort to provide support and legal defense to LGBTQ persons in Cameroon, Nkom founded the nonprofit Association for the Defence of Homosexuals (ADEFHO). No other group does this pro bono advocacy work in her country or the rest of Western Africa. In Cameroon, engaging in same-gender sexual acts can lead to fines and imprisonment. Many of the people are arrested on rumor. By 2011, Nkom had participated in 50 trials of LGBTQ people and facilitated the release of an additional 50 clients without trials. That same year the European Union granted ADEFHO a 300,000 Euro grant, which Cameroon officials interpreted as blatant disregard for Cameroon laws. Because of her work and the growing international prominence of ADEFHO, the Cameroon government threatened to arrest Nkom in January 2011. That arrest never occurred. Nkom credits international support for allowing her to maintain her freedom. 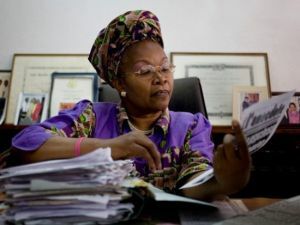 Nkom’s most famous case began in 2005, when she defended the Yaoundé 11, a group of men arrested that year during a raid on a gay bar in Cameroon’s capital city. They languished in prison for a year, but the case garnered international attention. In 2006, the United Nations Working Group on Arbitrary Detention took note of the case and condemned Cameroon for detaining the men solely due to presumed sexual orientation. It also declared the anti-homosexuality offences in Cameroon’s Penal Code as contrary to international human rights law. The African Commission on Human and Peoples’ Rights also challenged the men’s continued detention. Although the international attention itself was a major human rights victory, Cameroon’s government in 2011 introduced new laws to link homosexuality to pedophilia. Nkom continues to challenge these laws. Mark Canavera, “Leading Cameroonian Gay Rights Activist Fears Arrest,” Huffington Post (January 9, 2011); Stephen Gray, “Interview: Alice Nkom and Jonathan Cooper on the future of criminalization,” Pink News (November 18, 2011); Email correspondence between Stephane Koche and Tisa Anders, June 19, 2012; http://www.dev.humandignitytrust.org/uploaded/Alice_Nkom_Launch_speech.pdf.